OOPS! 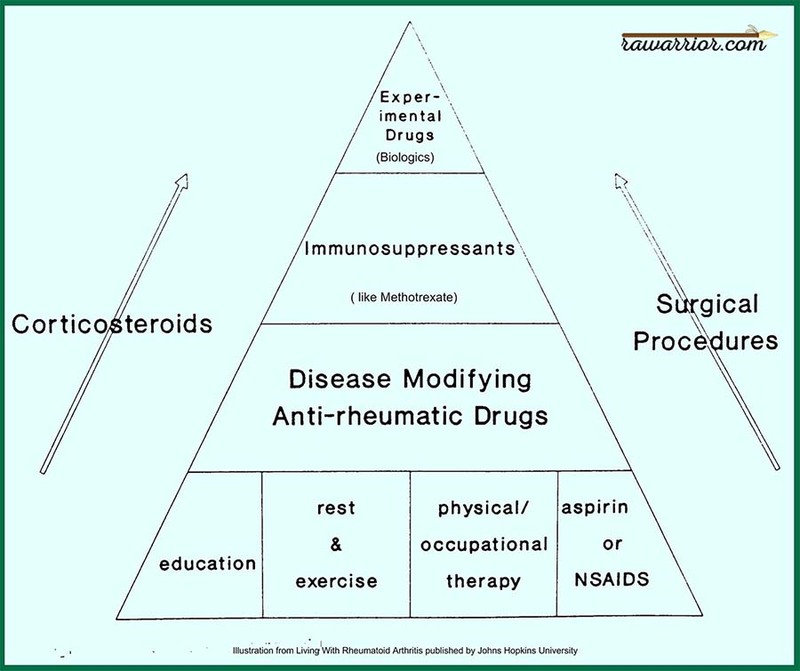 If you’ve read many books or articles on the treatment of Rheumatoid Arthritis, you may have heard of the treatment pyramid. During past decades, this was the general treatment plan for all RA patients (regardless of disease course type). If you have pain, you use otc NSAIDS. If it gets worse, and you have obvious inflammation, you use prescription NSAIDS. If you come back to the doc asking for something stronger, you get an actual steroid prescription. If you don’t get better after a couple of years, you get some kind of DMARD (disease modifying) prescription. Low dose. If you keep complaining, you may get to add a second DMARD. By now, you may have had a surgery and a steriod injection or two. If you are stubbornly not cured, you may end up eventually on a combination of DMARDS and NSAIDS which hold your symptoms at bay (called a season of remission) – except for when you flare. Of course, the newest medicine available at the top of the pyramid is a Biologic (read Enbrel, etc.) However, by that time, you have lots of irreversible damage. I feel hopeless just reading that. Who could climb that pyramid without getting hurt? The pyramid has been scrapped! 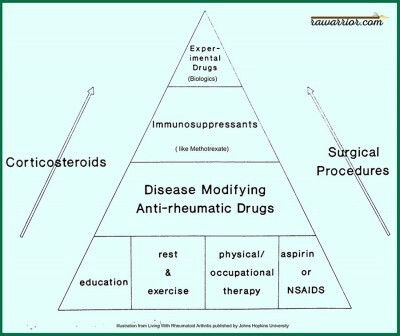 In recent years, the ACR (American College of Rheumatology) has begun to recommend inverting the pyramid. They realized that all that time RA patients were in pain, they were also suffering damage. Damage from day one! The goal is to bring remission sooner and prevent more damage. Some who have been sick with RA for decades have lived through all the changes. I lived through the same thing with Hashimoto’s disease (an autoimmune thyroid disease). 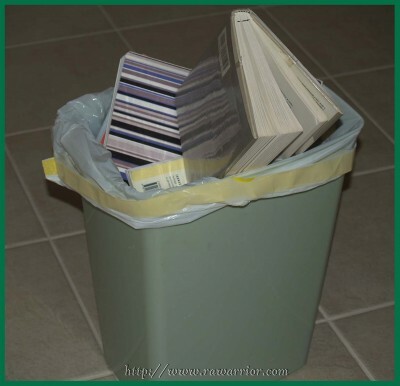 During the 30 years that I have been diagnosed, they have thrown out the books twice – and rewritten them! Oops. That has had a big impact on the treatment that I am able to receive. Of course, medicine is a practice and most doctors are practicing it the best that they can. But, they can’t learn to do any better if we just keep quiet about it. I want patients to be a part of this process as we continue to re-write the books. ← Can Rheumatoid Arthritis Kill You? Thank you so much for your website….and I love this post! I am a newbie…diagnosed in late April. My regular doctor said that this is a "good" time to be diagnosed because rheumatologist's are treating more aggressively and with better drugs. I am hoping for drugs that will help with the pain and decrease the erosions. I am just on 20 mg of Prednisone right now until I can get into my first appointment with the rheumatologist on the 30th of this month. Loving thoughts to all who come to your meeting place. Thank you. Well said Kelly. My mother-in-law was diagnosed at 40ish. She had NSAIDs and nothing else. The doc told her they'd treat as it worsened. Well now, 20 some years later most of her joints are deformed and she can barely walk. Unfortunately there re still some doctors who still treat using the old pyramid. I've been concerned about my own joints getting with all the pain and my old rheumatologist said it was too early for joint damage. I didn't believe her then. Glad I got somebody new! What a great comment:so much good stuff in a few words. IMHO there is never a good time to be diagnosed. But I know what he means. I hope you will learn as much as possible before the appointment so that you can have a good 2-way conversation with the Reumie. Wow, my appointment is on the same day. So, I will remember you that day too. Remmember, the Pred. makes you feel better, but that is temporary. It is not the cure. I hope we get to talk more sometime. Maybe you can email after the appointment. Your old rheumatologist is just that: old. Old school. I am sorry for your mom-in-law, but we will make it better for those who come after us. And hopefully for US, too. I am like Giant Fan's mother-in-law, damage done. My wonderful pain doctor just shook his head and patted my hand as he explained some "truths" to me. He wasn't trying to be mean or not encouraging. I want to encourage all you younger people to find the best solutions for YOU! You deserve it. Great post Kelly! Even though I suffered undiagnosed for 4 years, once I was diagnosed, my rheumy moved pretty rapidly to Enbrel. I'm glad the pyramid was inverted! Makes me wonder what things will be like in another 20 years? A cure perhaps?! BTW…my mother had Hashimotos hypothryroidism. Have you found any link between it and RA? I’ve had Hashimoto's most of my life. It is cyclical: both hyper and hypo. I do not know the link except that there are so many of us with more than one of these things. I also have the Sjogrens – my experience says “yes” but we’ll have to wait on the science. I found one study today that indicated that a significant proportion of people with RA also have related autoimmune issues like hashimotos, lupus, etc…Like pouring gasoline on the fire! My rheumy also mentioned that such things tend to have a genetic link. First, welcome to the "Club" Noelle. I'd like to say I'm gald you joined by it's never a good thing to be in a club like this. Make sure you research your rheumies before you settle on one. If I might suggest, try to get into and allergy and immunology group. I just switched to one b/c my first rheumy wasn't the greatest. She wasn't aggressive enough. Now I have a good group and I'm starting a drug study for a possible new RA drug fom Pfizer Corp. I've heard good things about it so hopefully It'll be approved soon. I'll be blogging about it daily if you're interested. Kelly, a woman I know who has Sjogren's and it runs in her family. We were comparing our "meth" doses and effects, etc. and we got to discussing the possible connections of all this and we decided that they are all connected. She has others in her family who have Sjogren's along with other auto-immunes like RA and ulcerated colitis. My cousin has an autoimmune disease that I can't remember what it is. She also has RA like symptoms. Just some food for thought. It took some searching since that website had changed its permalinks, but I have found the link and fixed it in the post. Thanks for letting me know so I could fix it. Link to http:// healthplushra.staywellsolutionsonline.com/ doesn’t work. Does not seem to exist. Or, is this an “across the Atlantic” problem? I was reading more info on RA treatments and ran across this. “People who haven’t responded to the DMARDs may consider another new treatment called apheresis with Prosorba. I’m pretty sure that experiment failed and they don’t do it anymore. It did sound like a good idea… I have tried in the past, but haven’t found anyone doing current research on that. I’ll check out your link, though. Thanks. When I was diagnosed in 1980, this was the preferred treatment plan. Because of it, I’m probably far more disabled today than if they had placed me on DMARDS immediately. I had RA for 10 years before they put me on a DMARD. Thank goodness this model is on its way out! Just found this site, after crying over a recent RA doc visit. Thanks for helping, explaining and listening. I was diagnosed 9 months ago and have made no headway. But today, I printed out some infomation and and am going in armed with handouts at my next appointment on Tuesday. They were nice enough to fit me it. Have a great day everyone! Maria, I’m sorry to hear you’re not making headway. Is this appointment a new doc? Let us know how it goes. Good luck. I really appreciate your website, Kelly ! I had my second visit with a rheumatologist today who told me that my blood work was withing normal limits but that because my symptoms have responded so quickly to prednisone in the past, I likely do have an “inflammatory arthritis that is autoimmune” but he stopped short of saying that it was RA. He wants to start me on Plaquenil after an eye exam next week. My mom had RA. I have had pain in my feet, legs and shoulders and unrelenting “bursitis” (bilaterally)in my hips and for 4 years now. I have had numerous injections. I can no longer work as a birth doula. I am a certified perinatal educator and used to working in the medical system and this disease and all it’s ugly cousins are the most confusing things I have had to navigate in a long time. I wonder why he won’t call what I have RA or whatever he does thing it is ? This is making me crazy. ACK !!!! I’ve been offline for a few days due to a virus – I hope you’re still reading! All of my kids were born at home. You do such important work. I’m sorry the RA has prevented you from assisting births. I agree that so little is known about RA that the medical system can be a nightmare with this disease & the many ways it affects people. I’ve heard your diagnosis many times from patients & it might be differently labeled by a different dr. It just means he’s not certain – but at least he wants to start treatment any way. If you’re not comfortable with his approach (too aggressive or not enough), talk with him about it. You can always get a 2nd opinion if you’re concerned. I’m guessing from your email that you might be originally from VA – that is my home too & I miss it so much. I’ve been there – I know just where it is. So beautiful!! I was diagnosed with psoriatic arthritis 7ish years ago and had an apparently forward thinking doctor who started me on Remicade immediately. I ended up with a antibiotic resistant infection that lasted for months and scared me to death. I discontinued the treatments, and now after years of band-aiding the pain with narcotics and fighting paralyzing fatigue I’m considering trying one of the new biologics…but I’m really, really (did I say really?) afraid. Hi Jill, I understand why you’d be worried & I wish there was a way to guarantee that won’t happen. Hopefully, with close monitoring, a different treatment would work out fine. Maybe you could talk to your doc about additional cautions to avoid infection. Hi Kelly. I hope you’ve decided to give biologics a try! If you’re still unsure, I’ve got either rheumatoid or psoriatic arthritis, depending upon which of my three rheumatologists you listen to (no, not three at once, I went to three different doctors before I found one who listened when I said that I couldn’t tolerate DMARDS. Those drugs all made my condition much, much worse!). I’m now taking Xeljanz with absolutely no side effects! And I’m allergic to most DMARDs, can’t take sulpha drugs, now allergic (since RA) to amoxicillin, you name it, I can’t take it! Xeljanz isn’t the perfect drug; I still have twinges and jabs, but nothing like before. And it’s easy to take because it’s in pill form. I’m taking the Xeljanz along with Doxycycline, which helps with the peripheral neuropathy that I also have, and which seems to also help with RA symptoms. if more women have this disease,what do you tink of testosterone research or treatment?? Found this website. I’ve been crying and reading and anxious and reading. Reading to my husband he says this so tracks with what you have been going through. I have been going downhill since 7 years ago after my knee replacement. Leg pain / numbness diagnosed as nerve damage. Back surgery then hip surgery all in 2 years. But this other thing came creeping in. Tendonitis, neck pain, foot pain, fatigue, leg cramps and spasms. Finally sent me to Rheum to see if there was something else. Blood tests showed borderline Rhuem. Dr. put me on nsaid. side affects …then another…side affects, yuk. She is trying to get to Celebrex. Ins wants to know we tried the basic before getting the ‘designer’. I’m so worn out. I’ve been on oxycodone and zohydro for nerve pain. I also had a nerve stimulator implanted. I know after that implant my nerves in my trunk went haywire. They shot me with steroids which helped get me home from hospital. The nerves were still on fire so they put me on more steroids. Shortly after my hands would shake, then swell, hurt and finally they hurt all the time. My shoulder lit up and then my right whole right arm was excruciating, couldn’t move it. That finally left, but I now have tendonitis in both arms, inside my elbows and upper arm. I need to review this site more, find another Dr. I think. I am so tired of the pain. The usage used up. I guess I need a diagnosis or not. Do I have this or not. Deep inside this armor, the warrior is a child…… even though I am 58.